This page is provided as a service to people who have something they wanted to sell as a one-time sale. This is not intended to be a place for businesses as there is already another page for that. Note that this webpage is provided as a means to connect sellers and buyers and all transactions are between them. I am not involved and I don't want to know anything about it. By posting your items on this page, you agree that you are making an honest representation of the item that you are selling and you take full responsibility for your actions, whether you are the seller or the buyer. You shall *completely* absolve me and this website of any responsibility and liability if there are any irregularities in the transaction. I suggest having the transaction take place in public with witnesses around and check the product before handing over the payment. If the exchange is not done with cash and there is some concern over the payment, I recommend using Paypal or some other financial service. Always ask for a receipt. All posted items expire in one month or whenever I remember to check this page (whichever comes later). You can renew the listing before it expires. Please let me know when your item has been sold so I can remove the listing. Send all potential ads to dancenet@havetodance.com. I think it's pretty obvious that I reserve the right to reject *any* ad for any reason. Name of the person offering the item. Location where the item is offered. The transaction doesn't have to be local but it offers local buyers a chance to go and look at the item. Email address so potential buyers can ask questions. Phone number for people who are technology-disinclined. A title for the listing. 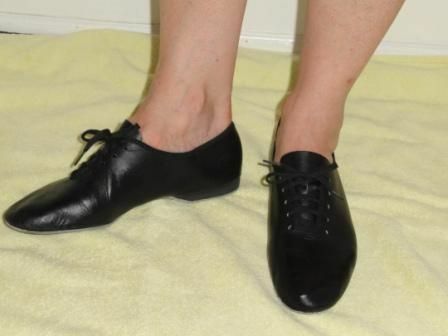 For example, "Men's dance shoes for sale"
A good description of the product. I really don't want a *lengthy* description and neither do you. If the description is too long, the reader might get distracted and move on to something else. Get their attention quickly. Make an honest evaluation of the condition of the item. A picture is optional but could dramatically improve the chances of selling your item. Help people out by taking a current picture of the item. The reader will be able to click on the pictures to get a bigger view. This is more like classified ads or a flea market: you're on your own! 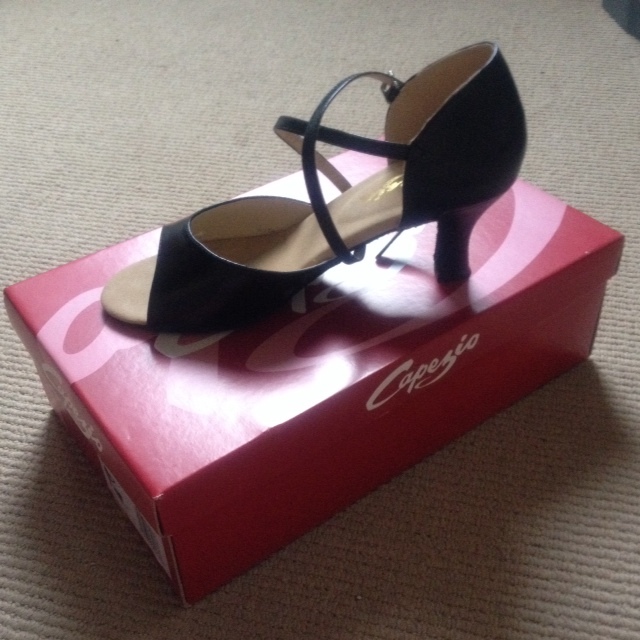 For sale: 1 pair of women's Capezio dance shoes, size 7½, worn once. Asking $65 or best offer. If interested, send email to Sharon at 1966sbd@hotmail.com. For an example picture, see the Capezio website. Location: Cambridge, Somerville, Watertown, Arlington, Belmont. All shoes are size 6, in very good condition and have suede bottoms. If interested, contact Lisa. Please include a phone number in your email. 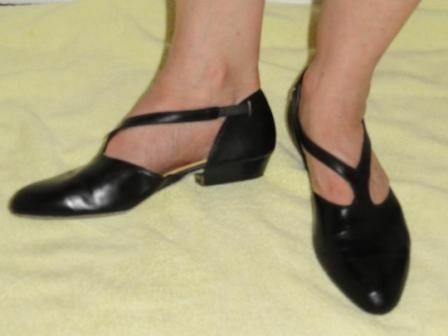 These are Georgio Brutini street shoes that had been sold as dance shoes. 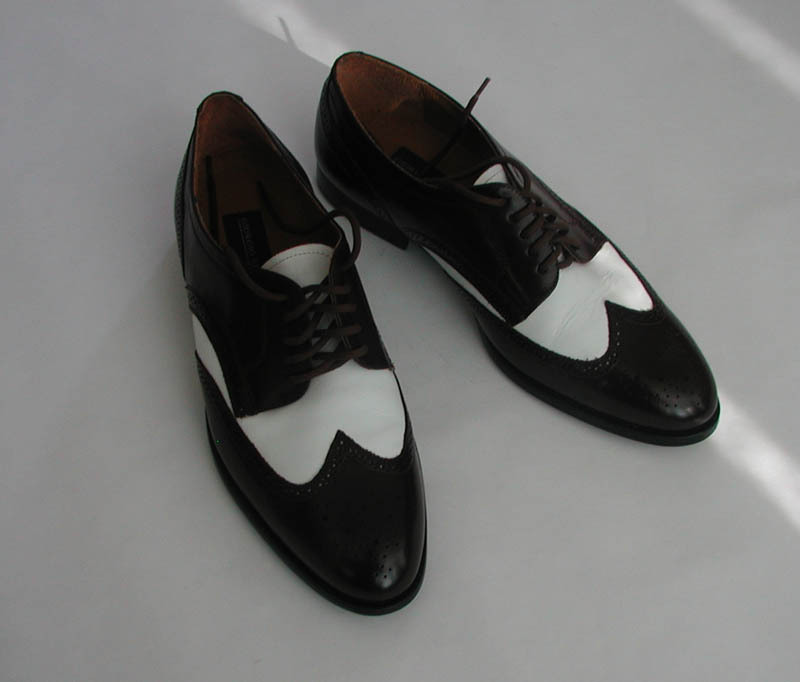 They are solidly built with smooth leather soles and are probably sturdier than shoes sold as "dance shoes". 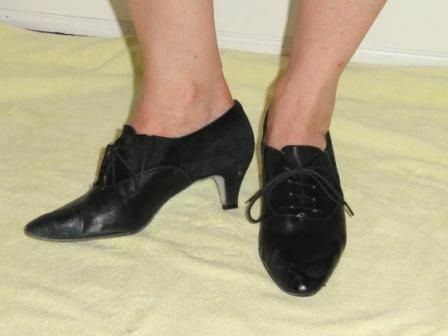 The shoes are a size 10d and are colored brown, though they look black in the picture. 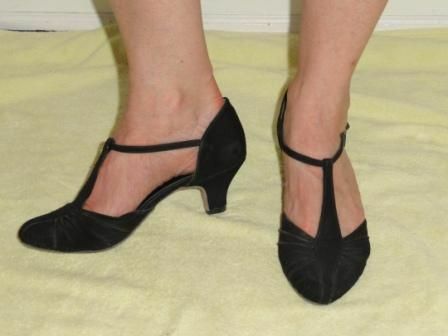 They don't look like dance shoes so they can be worn for other occasions (I own a pair of them in black). They were bought for a friend who decided he didn't want them so they were never worn. I don't see them being sold on the Internet anymore so you're probably getting something that most people won't have. I'm asking for $50. For more information, contact Benson Wong at dancenet@havetodance.com or 617-489-7278. 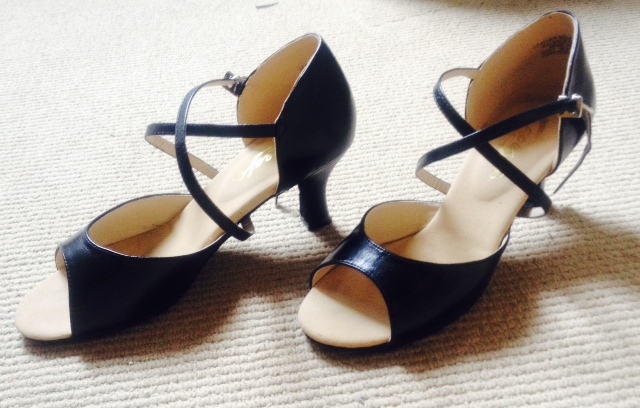 I have three pairs of authentic Argentinean tango shoes for sale. I am not able to use them myself, due to their size and/or heel height. 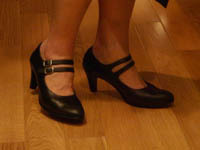 AnaLinda Sol, handmade in Argentina by Fattomano, purchased at Teddy's Shoes in Cambridge; closed toe, black, suede sole, with a front double strap, 2.75" heel, size 8; very sturdy and comfortable; worn about 15 times. Original price $80, available for $30. 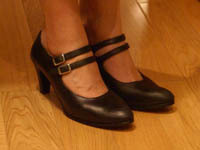 Belmonte, handmade in Argentina by TangoPro Shoes, original bag included; purchased at a milonga workshop in Cambridge; open toe, fine bronze lame, suede sole, with an above-ankle strap, 3" heel, size 6.5; lovely, seductive; worn three timesno exaggeration! Original price $115, available for $70. 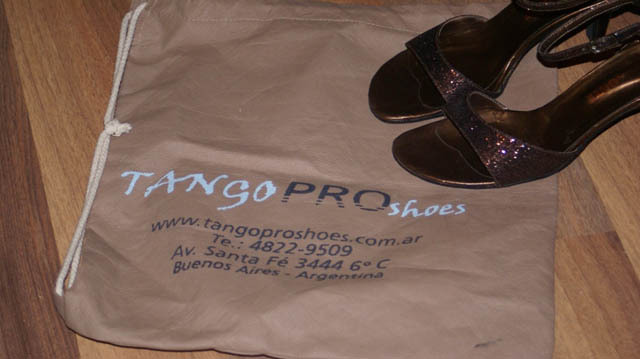 Bottier, handmade in Argentina for Tango Goods, a collaborative of six most well-known manufacturers in Buenos Aires, original bag included; open toe, combination of fine black lame and suede, leather sole, with criss-cross straps, 3" heel, size 8; elegant, feminine; tried on, never worn or danced in! Original price $179, available for $90. Will consider "best offers" for serious inquiries. For more information, contact Tatiana at 617-393-4204.